Some little-known pictures produced by our favorite crystal brand are the Swarovski CrystalograM creations. Briefly, a CrystalograM is a work of art by Hubert Weidinger with Swarovski crystal stones hand-set into the work which extends from a canvas across the frame to create an extremely unique portrait. 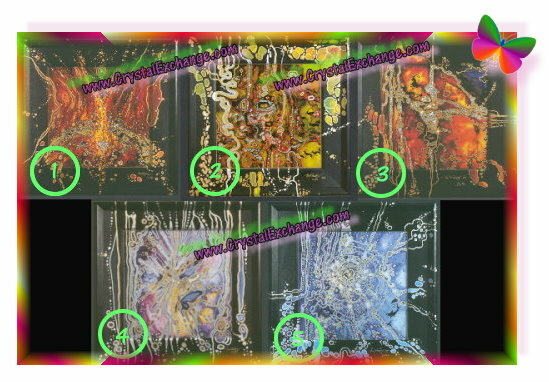 The five Swarovski CrystalograM pictures were available in two different sizes, both which were Swarovski limited editions. The smaller size was 12” square and was limited to 4,999 units. The larger size was 24.5” square and was limited to 99 units. The 12” CrystalograM was decorated with about 400 crystal stones retailed for approximately $350. The 24.5” CrystalograM was decorated with about 1200 faceted crystal stones and retailed for $5000. All the Swarovski CrystalograMs were officially available from 1993 through 1997, however some of them may have sold out prior to that due to the limited quantity available. While a few other CrystalograM designs have been documented, they were likely commissioned for special clients. Swarovski CrystalograM pictures are very difficult to find. At Crystal Exchange America, only a few have ever been listed and sold, and that was nearly a decade ago when the economy was much stronger. During that timeframe, the smaller ones sold in the price range of $650 – $900 each. The larger ones sold in the price range of $3000 – $3200. 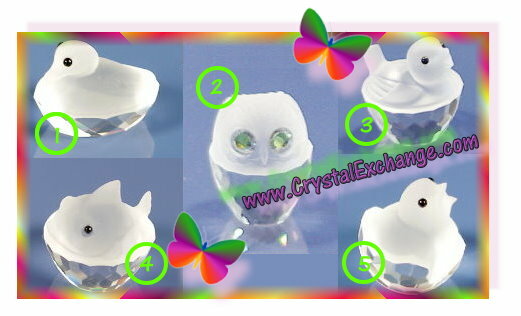 If were more to be listed in our online store at www.CrystalExchange.com , the Swarovski CrystalograMs would appear in the category “Limited Edition Swarovski”. 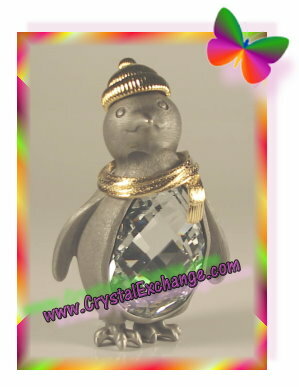 After writing the last article on the Swarovski Active Crystals, I was intrigued by the USB sparkly pets. In a spontaneous moment, I placed my order for the Swarovski Purple Chloy Memory Key in the online store. Perhaps it was a crazy idea….$100 for a USB, but it looked so cute! And last week, my Swarovski Turtle USB arrived…yeah! Everything looked all Swarovski-like on the outside….box, identification label, etc. I opened up the box and pulled the USB memory key out of the packaging and began looking for a Swarovski logo. On the back of the plastic USB, sure enough, there was a white Swarski swan on one of the turtle’s feet. Nearby the logo, the printed words said “Made in China”. Made in China? I guess I was taken back a bit by that. I knew that the turtle pulled apart as the head part is the USB. I tugged and tugged. It was rather stubborn, but it did finally release. The inside….now that was a surprise. I took a picture that shows the Swarovski USB Memory Key next to a USB stick that my kids use for school work. It looks a lot different. (Maybe this is the newest technology?) My kids didn’t even believe me when I said it was a USB! Of course, the Swarovski USB Turtle did indeed work when I plugged it into my computer. But in the end, here’s my opinion of my $100 Swarovski USB purchase. I don’t think the USB Turtle represents the high quality products that come to mind when I hear the word ‘Swarovski’. I didn’t really expect an inexpensive plastic turtle with USB 1.0 / 2.0 compatibility. I knew it was 4GB, but still think for the price, it should have been 8GB or 16GB and USB 3.0 compatible. My recommendation? Visit a Swarovski store so that you can see and know exactly what you are getting. 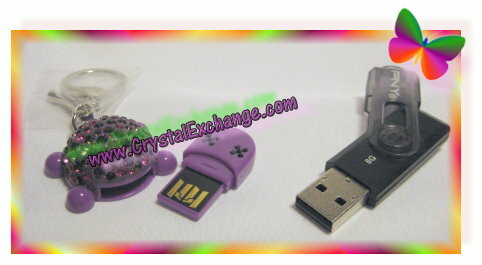 If this is not possible, buy a higher capacity USB with a warranty for $20 or less, and use the money saved for genuine Swarovski crystal figurines. Swarovski News: A Swarovski Designer Signing Event in Canada! We have some great news for our Canadian crystal fanatics friends! We have recently learned that there is a signing event in Toronto! The Swarovski Designers in attendance will be Anton Hirzinger and Heinz Tabertshofer. Forms are being mailed out and need to be returned to Swarski Canada by September 28, 2011. Tickets with signing times, will be mailed to Swarovski collectors in the last 2 weeks of October. 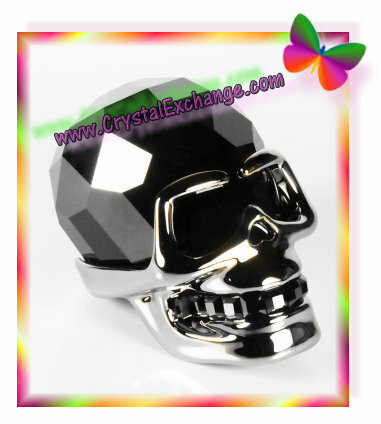 Swarovski crystal collectors may contact the Swarovski Canada or the store for more information. Giftware suite was a division of Swarovski primarily in business in the 1980’s through the early 1990’s. Giftware Suite is most well-known for the Swarovski Christmas ornaments. 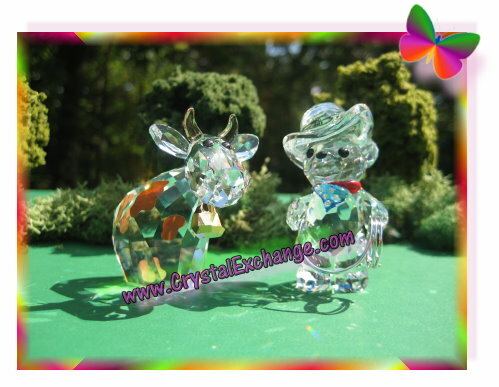 However, the Swarovski Giftware Suite division can also be credited with a number of other popular crystal products, like useful desk objects. 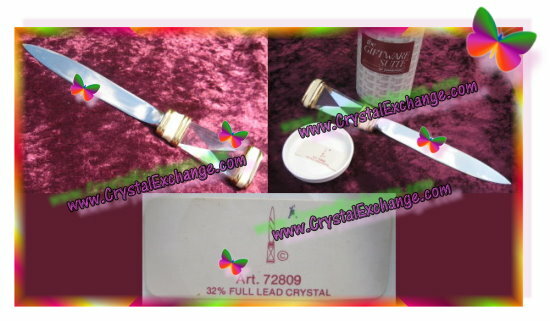 One such crystal figure was the Swarovski Giftware Suite Letter Opener. The Giftware Suite letter opener was marketed and sold in three different colors: red, green and black. All the letter openers were identified with a single Swarski part number 72809. While I was not able to locate official introduction or retirement dates, a Swarovski Block SC logo would indicate an introduction date of 1988 or earlier. A Swarovski Swan logo would indicate a production date 1989 or later. And the fact that Giftware Suite seemed to cease in 1992, would indicate retirement no later than 1992. Now, with some background information about the Swarovski Giftware Suite division and Swarovski letter opener, I share the news about the letter opener prototype that arrived at Crystal Exchange America in the course of a transaction. The letter opener was packaged in an original Swarovski box. For the Giftware Suite products, the box was mostly white. This Swarovski box even has the correct identification sticker on the lid. When I removed the foam and letter opener from the box, I was surprised to see that it was not painted with red or green or black trim…it was white trim. Not knowing what to expect, I enquired to the seller for more info on this unusual color. I learned that a family member was employed by Swarovski many, many years ago and purchased it in an employee clearance sale. From my understanding, prototypes and discontinued figurines would sometimes be made available to employees at discounted prices, and that was how this one was acquired. It was not clear how many Swarovski prototypes with white trim were made, but it was never produced for public distribution. The Giftware Suite letter opener was sold separately and as a part of an executive desk set. Other items in the executive desk set include a ball point pen, bookmark, letter opener, and card holder. 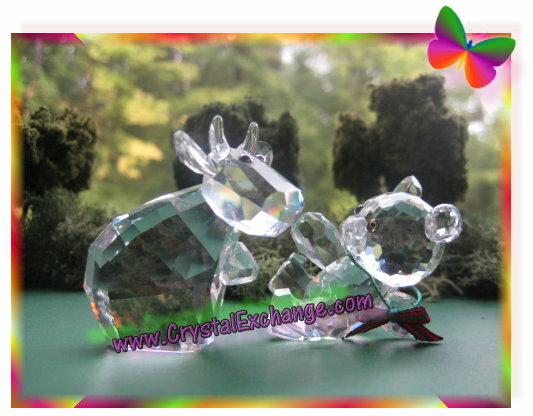 Crystal exchange America, located at www.CrystalExchange.com has some Giftware Suite figurines available in their online store. The Christmas Ornaments can be found in the ‘Christmas and Ornaments’ category. The other more functional units, pendants, and key rings / key chains, can be found in the ‘Vintage’ category, ‘Giftware Suite’ sub-category. This sounds like fun….a Swarovski Treasure Hunt! I was uncertain was the article was going to lead into when I read that SCVNGR and the famous crystal brand were co-sponsoring a city-wide treasure hunt in the London, UK. I had to read on. Summarizing, on September 24, 2011, there is a BIG treasure hunt going on in London. Up to 1300 couples can pre-register and share in this grand 3-hour event. Participants must download an iPhone or Android app to participate in this usual diversion. So what is motivating these teams to become involved in the treasure hunt filled with hidden prizes? Swarovski presents, Swarovski perfume, and Swarovski jewelry, valuing at nearly $1000 per person if all the tasks are accomplished. That would certainly motivate me! And the prizes get bigger! Three teams will be awarded grand prize trips to “Kristallwelten, Austria and a five-night stay in a fashion capital such as Paris, Florence, Barcelona or Istanbul”. How great is that! This Swarovski Treasure Hunt sounds sooooo amazing! To register or get more information, Swarovski fanatics can check out the Swarovski site at : http://www.swarovski.tv/discoveryourlight/ . I hope that SCVNGR and Swarovski will consider a venue a bit closer to Ohio (USA). I’d seriously have to consider upgrading to an iPhone to be a part of such an exciting and challenging affair! Swarovski is appearing on more cosmetics this upcoming holiday season. I found that Harrods will have an exclusive offering of Estee Lauder lipstick with Swarovski crystal embellished cases. 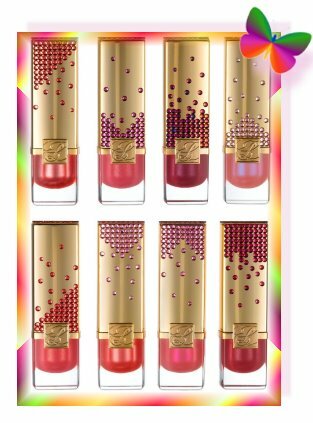 According to my sources, this dazzling offering of lipsticks by Estee Lauder will be available only at Harrods starting in November, 2011. There was no information available on lipstick color or if they would be some kind of limited edition. The price, factoring in currency conversion, would be about $35 USD. I really don’t know of that the traditional Swarvski crystal collectors would be likely to purchase the Estee Lauder lipstick just because of the crystal stones. However, if you simply love the lipstick brand or color, the extra bling just may be something that makes you want to purchase! I wonder what other blingy Swarovski accessories we might find coming out in the next few months!